Your Polymath has a Spring Cold. Sore throat, low grade fatigue, vague achiness (which is probably more related to many hours of tennis than a virus, but still). Ick. Working at home alone is actually sort of awesome when you are sick. You can stay in your PJs, sleep in, make yourself tea and toast, catch up on Love It or List It and see what those crazy Canadians are doing with their houses. And you don't feel guilty at all, because unless you are really knocked out, you can still get some work done. One of the dangers of working at home alone, especially when you are groggy and hopped up on cold meds, is that you may find that you talk to yourself. Out loud. You may occasionally narrate what you are doing around the house. In song. "I have to emmmmmmpty the dishwaaaaaaasher....but I don't waaaaaaaaannna....put dishes awaaaaaaaayyyyy...."
Also? The tiniest things can get stuck in your head and then you go off on a game of Name That Segue. "I should bring in the sidewalk salt off the porch. I have to refill the salt cellar. With Kosher salt, not sidewalk salt. Sort of weird contextually that I use Kosher salt to season pork. Morton's rhymes with Gorton's, which is funny, because fish sticks are from the ocean which is salty." Yup. Welcome to my brain. So of course, today I am walking around and looking for lozenges, which makes me think "Riiiiii-co-laaaaaa" and because I am me, that turns into "Freeeeee-gu-laaaaaa". 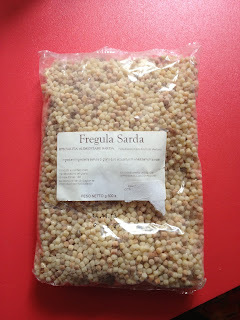 Do you know about Fregula? 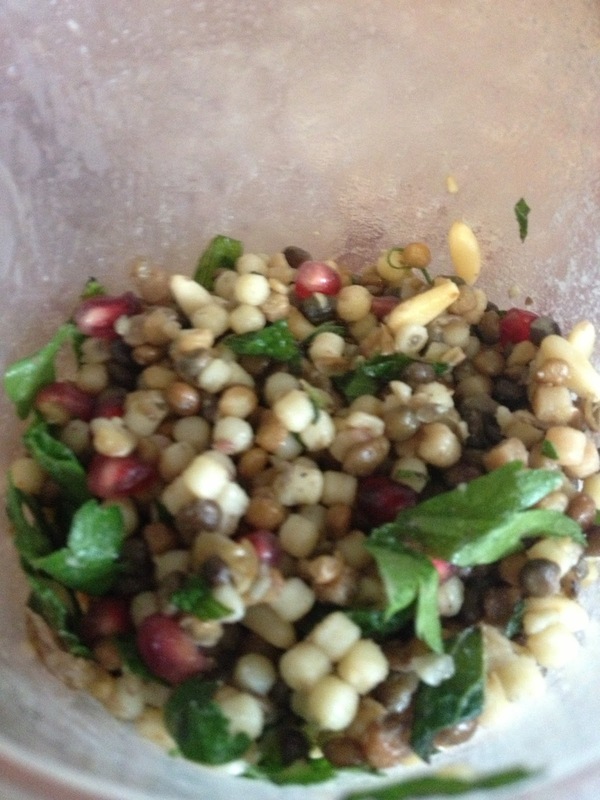 Sometimes spelled Fregola. You should. 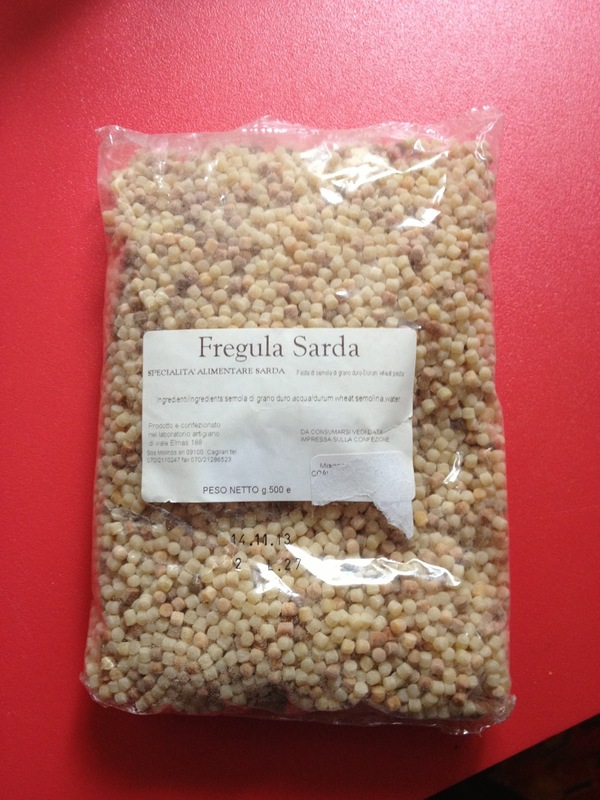 Fregula is a small pasta, about the size and shape of Israeli couscous, but it is toasted. Which brings a whole new flavor to the party. It makes a fabulous pilaf, is far more interesting in soups than regular pastas, it is delicious hot, cold, room temp. I love it. Of course, it is a pasta, so with both Charming Suitor and I doing the low-carb thing, it has sort of been off the menu for a bit. Off the Menu! I wrote a book by that name, do you have your copy yet??? You can do that here. Sorry. Brain spasm. Where was I? Anyhoo, the other night we we having some friends over for dinner, and needed a side dish. I wanted to make something with fregula, but I also needed to make it as healthy as possible. I thought about our Healthy Crunch grains and cauliflower salad, where raw cauliflower is made the same size and shape as the grains to extend the bulk of the salad and lower the total carb intake. So that made me think about fregula and how to do the same thing. The solution? Lentils. Lentils are about the same size and shape as the pasta, and the tiny legumes are both delicious and very healthy for you. You can get them canned, precooked in the produce section, or dried. Even the dried ones aren't hard to work with, since unlike other dried beans, you don't need to soak them overnight, you can just cook them in boiling seasoned water for about 20 minutes. And they have a sort of nutty flavor, which is a great complement to the nuttiness of the toasted pasta. Just dump everything in a bowl and mix well. If it seems dry, add a little more oil, you want it moist, but not greasy. I like this at room temp, so if you make it ahead of time, take it out of the fridge an hour or two before you serve. Sorry for the crappy pic, have I mentioned that I have a cold? Do any of you have some interesting new ingredients you are loving these days?